Avocados are healthy, delicious, and easy to prepare. It is a source of vitamin K, potassium, folic acid, vitamin B6, vitamin C, copper, and contain low calories. It is unfortunate that people don't use it more often. There are some things you must remember while preparing avocados. When buying avocados, leave it to ripe on the counter and put it in the fridge for later use. When fruit is dark green and soft to the touch (not too soft though) it is ripe and good to eat. Using a chief knife, cut the avocado in half (as shown in the picture). The seed can be removed by pushing the knife into it (just give it a wack) and twisting it out. You can then peel it by hand. 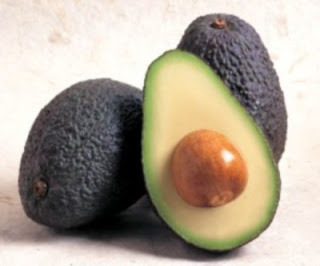 Avocados can be eaten raw, baked, grilled, or made into a sauce. The quickest and easiest way to incorporate avocado into your diet is to put it in a sandwich or make a milkshake. A couple of slices of bread, mayonnaise, ham, lettuce, and avocado is great lunch during a busy day. Blend some milk, sugar (or honey), and avocado to make a refreshing milkshake. Next time you go to the grocery store, buy one and try it! You won't regret it (unless you're allergic like my roommate). If anyone wants specific recipes for cooking with avocados, leave me a message.